Genuine Full Grain 100% Leather belt that is comfortably soft and this durable one-piece will have you looking good for the years to come. Unique design antique brass mixed with copper finish looks to have a slight turquoise patina developing. 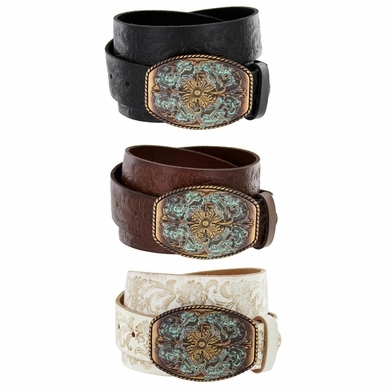 Classic western hand-tooled embossing to match the uniqueness of the buckle.Buckle size approx: 3 1/2" x 2 3/8" and fits 1.5"(38mm) belt straps or narrower. Sizing: Measure around where you wear the belt and order that size.